Ocracoke certainly had an unusual winter. With two wonderful snowstorms and the school closed for sev­eral days, the kids had a chance to slide down the icy slope at the new Ocracoke Volunteer Fire De­partment building. We had a rare view of a snow plow clearing the roads of the village. Something even rarer seen on the island had a positive impact on the community–snowy owls. These arctic birds live under some of the most extreme con­ditions imaginable. Their typi­cal idea of a winter retreat is the Canadian Province of Quebec. It is extremely rare that they would appear as far south as North Caro­lina. Starting last November how­ever, reports of these owls began to appear in local newspapers primarily throughout the East­ern United States, a sign that this would be “an invasion year.” By February an amazing num­ber of 2,500 owls were reported throughout 25 states. One plausible theory why so many have appeared in the Unit­ed States this year is that the lem­mings that they feed on were in abundance last summer and there­fore permitted more young birds to fledge. These young birds were later driven out of the territories controlled by the adults. Indeed, most of the owls that have arrived in the region appear to be first-year birds. On the Outer Banks, one was first seen at Cape Point on Hat­teras Island in mid-November and hung around till around Dec. 23. On Dec. 27, Islander Kelley Shinn was at South Point and spotted a snowy owl standing on a dune. She soon ran into Lisa Day Eiland of Philadelphia who had a camera and took some pho­tos. Word spread, including a text message to me as I was returning to the island from up North. The owl was very watcher-friendly, so to speak, and many Ocracokers headed out to the beach to see it. At sunset on Dec. 31 Hal Broadfoot of Fayetteville with some birding friends was observing the owl on the flats of South Point when a second owl landed near it, confirming that there were two snowy owls here. News of these owls spread on the Internet, and in January and February, a normally quiet time, visitors booked rooms and hit the open restaurants after trekking from afar to see their first snowy owl. I let people know primarily via Facebook that I would assist their quest by providing current owl information and when possible taking them personally out to the beach in my red Jeep. By the end, I had helped about 250 people see the owls. Only a few days were we unsuccessful. A routine of meeting at 9:30 a.m. at the Variety Store was estab­lished to accommodate the Cedar Island and Hatteras ferry arrivals. The search-and-find routine in January and up to about mid- February was roughly a two-mile stretch from South Point to the airport access ramp. Within North Carolina, there have been about 25 sightings, sometimes for just a day as was the case on Dec. 21 in Little Washington. The owls, once they discov­ered Ocracoke, however, settled in. This might be because the beach and dunes are similar to their native open, stark tundra habitat, especially South Point. Judging from the many rodent tracks amidst the dunes, there was adequate food supply. By mid-February they started to appear at the pony pasture, sometimes seen on the railing or on dead cedar branches on the sound side. These owls are magnificent creatures and highly photogenic especially within the aesthetic beauty of Ocracoke. Most of the off-island visitors returned home not only with fond memories of an unanticipated winter trip to Ocracoke to see a rare bird, but also with great photos. 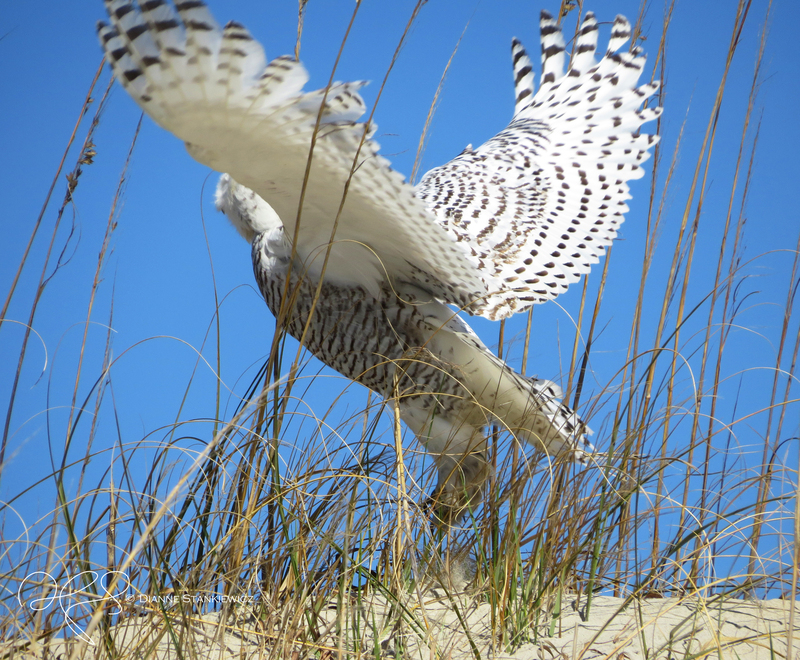 If you would like to see some of them, check out the Facebook page called Ocracoke Island’s Snowy Owls. The last sighting of a snowy owl here that I’m aware of was on March 8, a beautiful Saturday morning. The next day after an exten­sive search, none were seen. Dur­ing the following week after sev­eral futile searches, it was time to invoke the Beatles’ “Norwegian Wood”: These birds have flown. We hope they have safely re­turned to the arctic and will con­sider revisiting us next winter.